In Buddhism, bodhicitta[lower-alpha 1] (Sanskrit: बोधिचित्त; Chinese: 菩提心, putixin; Japanese: 菩提心, bodaishin; Standard Tibetan: བྱང་ཆུབ་ཀྱི་སེམས་, Wylie transliteration: byang chub kyi sems; Mongolian: бодь сэтгэл; Vietnamese: Bồ-đề tâm), "enlightenment-mind", is the mind that strives toward awakening, empathy and compassion for the benefit of all sentient beings. Etymologically, the word is a combination of the Sanskrit words bodhi and citta. Bodhi means "awakening" or "enlightenment". Citta derives from the Sanskrit root cit, and means "that which is conscious" (i.e., mind or consciousness). Bodhicitta may be translated as "awakening mind" or "mind of enlightenment". Bodhicitta is a spontaneous wish to attain enlightenment motivated by great compassion for all sentient beings, accompanied by a falling away of the attachment to the illusion of an inherently existing self. The mind of great compassion and bodhicitta motivates one to attain enlightenment Buddhahood, as quickly as possible and benefit infinite sentient beings through their emanations and other skillful means. Bodhicitta is a felt need to replace others' suffering with bliss. Since the ultimate end of suffering is nirvana, bodhicitta necessarily involves a motivation to help others to awaken (to find bodhi). A person who has a spontaneous realization or motivation of bodhicitta is called a bodhisattva. Different schools may demonstrate alternative understandings of bodhicitta. Some bodhicitta practices emphasize the absolute (e.g. vipaśyanā), while others emphasize the relative (e.g. metta), but both aspects are seen in all Mahāyāna practice as essential to enlightenment, especially in the Tibetan practices of tonglen and lojong. Without the absolute, the relative can degenerate into pity and sentimentality, whereas the absolute without the relative can lead to nihilism and lack of desire to engage other sentient beings for their benefit. The way of the King, who primarily seeks his own benefit but who recognizes that his benefit depends crucially on that of his kingdom and his subjects. The path of the boatman, who ferries his passengers across the river and simultaneously, of course, ferries himself as well. That of the shepherd, who makes sure that all his sheep arrive safely ahead of him and places their welfare above his own. We are describing here the late systematized Indo-Tibetan Mahāyāna. It seems that in the relatively early Ugraparipṛcchā Sūtra, for example, the bodhicitta is a much vaguer concept, more "a certain state of mind" in which a Bodhisattva acts (Nattier 2003a: 148). [...] Pagel points out that many Mahāyāna sūtras, including the Bodhisattvapiṭaka, hold that the arising of bodhicitta (bodhicittotpāda) is not simply a static thing that occurs just at the beginning of the Bodhisattva path. Rather it is continuously retaken and evolves through practice. Geshe Chekhawa Training the Mind in Seven Points in the 12th century CE. Mahayana Buddhism propagates the Bodhisattva-ideal, in which the Six perfections are being practiced. Arousing bodhicitta is part of this Bodhisattva-ideal. In Mahāyāna and Vajrayāna Buddhism, the goal of Buddhist practice is primarily to be reborn infinite numbers of times to liberate all those other beings still trapped in samsāra. Mahāyāna Buddhism teaches that the broader motivation of achieving one's own enlightenment "in order to help all sentient beings" is the best possible motivation one can have for any action, whether it be working in one's vocation, teaching others, or even making an incense offering. The Six Perfections (Pāramitās) of Buddhism only become true "perfections" when they are done with the motivation of bodhicitta. Thus, the action of giving (Skt. dāna) can be done in a mundane sense, or it can be a Pāramitā if it is conjoined with bodhicitta. Bodhicitta is the primary positive factor to be cultivated. The Mahāyāna-tradition provides specific methods for the intentional cultivation of both absolute and relative bodhicitta. This cultivation is considered to be one of the most difficult aspects of the path to complete awakening. Practitioners of the Mahāyāna make it their primary goal to develop a genuine, uncontrived bodhicitta which remains within their mindstreams continuously without having to rely on conscious effort. The practice of the Pāramitās (Generosity, Patience, Virtue, Effort, Meditation, and Insight). The Taking and Sending (tonglen) practice, in which one takes in the pain and suffering of others with the inhalation and sends them love, joy, and healing with the exhalation, and the Lojong (mind training) practices of which tonglen forms a part. Viewing all other sentient beings as having been our mothers in infinite past lives, and feeling gratitude for the many occasions on which they have taken care of us. Tibetan Buddhists maintain that there are two main ways to cultivate Bodhichitta, the "Seven Causes and Effects" that originates from Maitreya and was taught by Atisha, and "Exchanging Self and Others," taught by Shantideva and originally by Manjushri. with these serving as the basis, the way to meditate on giving and taking (tonglen). The practice and realization of bodhicitta are independent of sectarian considerations, since they are fundamentally a part of the human experience. Bodhisattvas are not only recognized in the Theravāda school of Buddhism, but in all other religious traditions and among those of no formal religious tradition. The present fourteenth Dalai Lama, for instance, regarded Mother Teresa as one of the greatest modern bodhisattvas. ↑ For definitions of the components of the term see Wiktionary: bodhi and citta. ↑ The classic text on śunyatā is the Prajñāpāramitā Hṛdaya Sūtra, a discourse of the Buddha commonly referred to as the "Heart Sūtra". ↑ Das, Surya (1998). Awakening the Buddha Within: Tibetan Wisdom for the Western World. Broadway Books. pp. 145–146. ISBN 0-76790157-6. ↑ Das, Surya (1998). Awakening the Buddha Within: Tibetan Wisdom for the Western World. Broadway Books. p. 149. ISBN 0-76790157-6. 1 2 3 Fischer, Norman (2013). Training in Compassion: Zen Teachings on the Practice of Lojong. Shambhala Publications. p. 11. ISBN 9781611800401. 1 2 3 Khenpo, Nyoshul; Das, Surya (1995). Natural Great Perfection. Snow Lion Publications. p. 56. ISBN 1-55939-049-2. ↑ Trungpa, Chogyam. Cutting Through Spiritual Materialism. Shambhala Publications. pp. 197–199. ISBN 978-1570629570. 1 2 "The Practice of Tonglen". Shambhala International. Retrieved April 3, 2015. ↑ Rinpoche, Patrul (1998). Words of My Perfect Teacher. Shambhala Publications. p. 218. ISBN 1-57062412-7. ↑ Williams, Paul (2008). 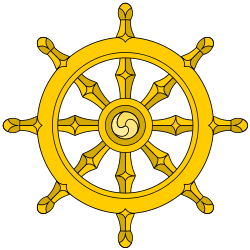 Mahāyāna Buddhism: The Doctrinal Foundations. Routledge. p. 355. ISBN 9781134250578. ↑ "The Thirty-Seven Practices of a Bodhisattva". Archived from the original on June 3, 2004. Retrieved April 3, 2015. ↑ "Eight Verses for Training the Mind" (PDF). Prison Mindfulness Institute. Retrieved April 3, 2015. ↑ Tsongkapa (2004). The Great Treatise on the Stages of the Path to Enlightenment Volume 2. Snow Lion Publications. p. 28. ISBN 978-1559391689. ↑ Rinpoche, Pabongka (1991). Liberation in the Palm of Your Hand. Wisdom Publications. p. 598. ISBN 978-0861711260. ↑ Dhammananda, K. Sri; Maha Thera, Piyadassi (1983). Gems of Buddhist Wisdom. Buddhist Missionary Society. pp. 461–471. ISBN 978-9679920048. ↑ Dalai Lama (2002). An Open Heart: Practicing Compassion in Everyday Life. Back Bay Books. p. 23. ISBN 978-0316930932. Lampert, Khen (2006). Traditions of Compassion: From Religious Duty to Social Activism. Palgrave Macmillan. ISBN 978-1403985279. Sopa, Geshe Lhundub; Pratt, David (2004). Steps on the Path to Enlightenment Vol. 1. Wisdom Publications. ISBN 978-0861713035. Harvey, Peter (2000). An Introduction to Buddhist Ethics. Cambridge University Press. ISBN 978-0521556408. Gyatso, Tenzin (1995). The World of Tibetan Buddhism: An Overview of Its Philosophy and Practice. Wisdom Publications. ISBN 978-0861710973. Powers, John (2007). Introduction to Tibetan Buddhism. Snow Lion Publications. ISBN 978-1559392822. Sangharakshita (1990). A Guide to the Buddhist Path. Windhorse Publications. ISBN 978-1907314056. Look up Bodhicitta in Wiktionary, the free dictionary.